Photo Caption: The Berkeley College Men’s Basketball team won its third consecutive United States Collegiate Athletic Association (USCAA) Division II Men’s Basketball National Championship on Saturday evening, March 5, 2017. 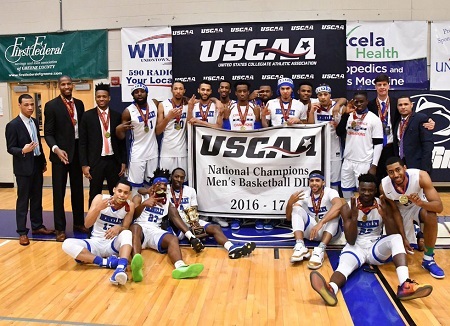 The Berkeley College Men’s Basketball team captured its third consecutive United States Collegiate Athletic Association (USCAA) Division II Men’s Basketball National Championship on Saturday evening, March 5, 2017, outlasting the No. 6-seeded Nittany Lions of Penn State York by a score of 80-76 in the title game of the championship contest held on the campus of Penn State Fayette. With the victory the Knights ended their unblemished 2016-2017 season at 29-0, while becoming the first team to win three straight USCAA crowns. Berkeley College also extended its program winning streak to 53 consecutive games. To read all of the game details in the story by Stephen Spagnoli, Berkeley College Assistant Athletic Director, click here. Player highlights of the game for the Berkeley College team included the USCAA Division II Men’s Basketball Player of the Year, Massiah Merritt, who scored a team-high 28 points, collected four rebounds, tallied three steals, and added two assists. Second Team All-American Stephon Jennings scored 10 of his 16 points in overtime while snatching nine rebounds, adding six assists, and tallying two steals. Ricardo Ayuso contributed 11 points, and Emmanuel Osama connected on his first four shot attempts, finalizing his night with eight points, five rebounds, and three steals. Last week, The New York Times published a story about the ongoing success of the Berkeley College Knights, highlighting what drives the players as student-athletes. Click here to read The New York Times story.